The Farmers’ Almanac expects summer temperatures in the eastern U.S. to “arrive right out of the gate with unseasonably hot and dry weather.” The Almanac is also predicting the northeast’s first official week of summer to “bring a spell of hot weather with many 90-degree temperatures and even one or two spots breaking 100 degrees.” Even as I write this—one week before the unofficial start of summer—temperatures in the northeast have topped 90 degrees for three consecutive days and rain has been sparse. I think it’s safe to say that in the race of summer heat against water conservation, summer is doing everything possible to get a huge head start and maintain a steady lead! Fortunately, as this info graphic demonstrates, even if summer comes on with an initial big burst of energy, homeowners can easily take the lead by implementing a strategy based on smart, steady water usage from May through September. Let’s take a look at what this winning approach should entail. Step one: Before stepping onto the track make sure you’re in top physical condition. Check all pipes for leaks and breaks to make sure you aren’t losing water. Check hoses for leaks and breaks, too. Make sure rain collection barrels and diversion conduits are not leaking. Step two: Learn everything you can about the competition. Hot weather isn’t the only competitor to water conservation during the summer. Everything from thirsty plants to evaporation compete for our valuable resource too! Not all plants need, nor should have, daily watering. Read up on your various forms of vegetation and water accordingly… not wastefully! Do you watering early in the morning or later in the evening when the sun is at its lowest to minimize water wasted through evaporation. Avoid watering in windy conditions. You’d be surprised how much moisture can be swept away by air currents and never make it to your plants. Watch the weather! Summer storms loved to crush the competition by “re-watering your gardens” after you have—wasting water and sometimes drowning vegetation. Check your weather app before you set out to water to make sure you do need to water. Step three: Conserve energy and finish strong! 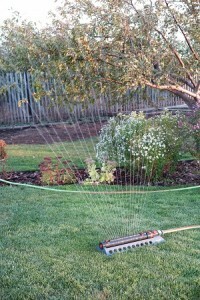 Avoid burnout by raising your lawnmower blade to between 2.5” and 3.5”. This setting won’t only help prevent grass from browning and requiring extra watering, it will also reduce weed growth, insects and disease. Watch where you’re watering. After setting or resetting sprinklers, watch them for several minutes and make adjustments if the water is hitting pavements, shaded areas or other areas not in need of watering. Mulch your beds. This is a great way to conserve water and help cut down on watering frequency. Collect rainwater and/or redirect downspouts to water your gardens. Also, consider using water from inside the house for outdoor plants. For example, wash vegetables in a basin instead of under a running faucet and use that water again for gardens. Remember, the ultimate key to winning the water race again summer is consistency! Making use of these tips regularly will prevent you from falling behind.